Law of Attraction abundance checks are a great way to attract money. Abundance checks give a direct order to the Universe to bring a specific amount of money to you, while also opening you up to receive money. That's how an abundance check works. You make out a check for the Universe to fulfill, and go about your life knowing that the money will come to you when it's time. It's that simple! 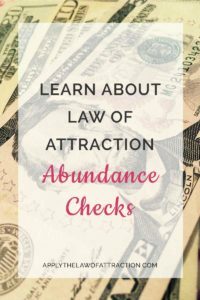 People who use Law of Attraction abundance checks find that they do receive money. The Universe provides ways to bring them money all the time. Before I tell you how to use abundance checks, check out this video where Jim Carrey describes how he used an abundance check to create $10,000,000. 1. You need a blank check. It can be a real check or one you have created on your computer or drawn on a piece of paper. If you create it yourself, try to make it as realistic as possible to help convince your subconscious mind that the check is real. 2. Fill in the date using a date in the future for when you'll receive this money. 3. Make the check payable to you. 4. Write the amount of money you want. It can be enough to pay your bills, to give you extra spending money, or a large dream like Jim Carrey had with $10,000,000. 6. Sign the check “The Universe,” “The Law of Attraction,” “God,” or any other name that represents the force that will bring you the money. 7. Put the check in a place where you'll see it daily. Some ideas: You can tape it to a bathroom mirror, your refrigerator, your computer monitor, or put it in your wallet like Jim Carrey. You can add power to your abundance check to make the Law of Attraction manifest the money faster. You do this by writing your abundance check within 24 hours of the New Moon. The New Moon has long been recognized as having a special type of energy. It is about new beginnings, setting intentions, and transforming your life. Writing your check at the New Moon sets the intention to manifest money for the next lunar cycle. Fantastic! The video reminded me of how Carey did what he did, but your step-by-step procedure makes it real. I’m writing my check now! Great to hear Joshuah! Let me know how it works for you. Love it! Love it! Love it! Your advice is spot on! Thanks for the steps. Other sites just throw words out there, your site gives me answers. I’m glad you’re enjoying the site Frannie! Thanks for letting me know.